Take a couple of seconds to run through your movements yesterday in your mind. Whether you were busy with life, work or play; I’d bet that you spent the majority of your day inside. Today, in the developed world, people spend on average a whopping 90% of their time in buildings or vehicles. Should we be concerned? There are of course health risks associated with sitting at a desk or on the sofa for long periods, and not getting enough sunlight. But I suspect most of us wouldn’t consider the risks of doing the one activity that happens wherever you are: breathing. 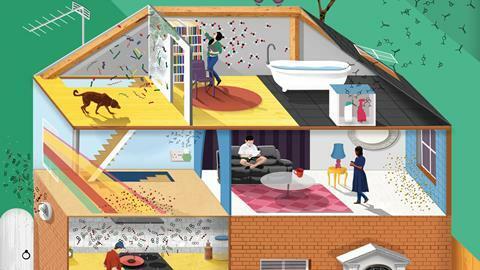 And maybe we should – the health effects of the air we breathe indoors are just beginning to be understood. According to a report by the UK’s Royal College of Physicians and the Royal College of Paediatrics and Child Health, indoor air pollution may have caused or contributed to 99,000 deaths in Europe in 2012. That ‘may’ make you raise your eyebrows, but the uncertainty reflects the state of our knowledge. As well as being implicated in cardiovascular and respiratory diseases, indoor pollution could have a role in neurological diseases and diabetes. But even approximate figures cannot be given with much confidence because we have so few studies on the impact indoor air pollutants on our wellbeing. By contrast, the health impacts of outdoor air pollutants are now fairly well understood – with legislation in place in many parts of the world, such as limiting traffic and implementing smoke control areas in major cities. (Although significant issues over some locations’ abilities to stay within these safe limits do remain.) But with the exception of smoking bans, indoor air legislation remains patchy at best. The pollution found in indoor air can be divided into four categories, explains William Nazaroff, professor of environmental engineering at University of California, Berkeley, US. Firstly, there are emissions from building materials and other products used indoors. This category includes volatile organic compounds such as formaldehyde, a respiratory irritant and carcinogen. Formaldehyde is off-gassed from many items in our homes, with the glue holding together press-wood such as MDF and plywood thought to be the biggest contributor. Semi-volatile organic compounds used as plasticisers and flame retardants are also a concern. ‘Some of these semi-volatile organics can mimic the hormonal processes that take place in the body and so being exposed to these things can lead to endocrine disruption,’ says Nazaroff. Bacteria and other microbes are also a concern, for example the indoor airborne transmission of diseases such as SARS and the common cold. ‘We’re also concerned about moisture and dampness in buildings leading to excessive exposures to the byproducts of mould that then cause or contribute to asthma and allergy,’ Nazaroff says. The final two categories are pollutants that also pose a problem in outdoor air. Miniscule specks of dust known as particulate matter are the most important category of outdoor air pollution with respect to the adverse health consequences. ‘Particulate matter is also quite important indoors, partly because the particles from outdoors get in and partly because we have indoor emission sources,’ explains Nazaroff. Products of combustion – including carbon monoxide, nitrogen dioxide, polycyclic aromatic hydrocarbons and also particulate matter – make up the final category. ‘Combustion is a major air pollution source and any unvented or inadequately vented combustion that takes place indoors raises major health concerns,’ says Nazaroff. This isn’t just smoking and dodgy fires and boilers; pollutants given off during food preparation and burning candles are also significant contributors. Another complication is that no two buildings are the same. Even if your home is right next to an identical property, and it houses the same number and age of occupants; how you live in the property, from the furniture to the cleaning products you use, to the meals you cook, will render the air in each house completely different.And finally, all those chemicals are constantly reacting to form other chemicals, adding another layer of complexity to the problem. Many pollutant interactions are well-documented in the outdoor environment, but again that level of knowledge doesn’t exist for what’s happening indoors. The first challenge researchers face is creating a definitive list of the chemicals that are present in the indoor air and their sources. This is no simple task. While many countries have extensive networks of analysers monitoring outdoor air pollution – in urban areas, at least – there are no equivalent monitoring systems in place for indoor air. Instead, a combination of large surveys and small intensive case studies are used to provide real-life data. Intensive case studies look at between one and 10 indoor environments in much more detail. For example, in 2015, his team reported the results of an intensive case study monitoring the air in a university classroom using a mass spectrometer. ‘[In these studies] we measure the processes that influence concentrations and how those pollutants behave in the indoor setting with as much detail as we can muster,’ says Nazaroff. Over five days they recorded the number of students in the room and measured the concentrations of volatile organic compounds and carbon dioxide every five minutes. ‘We found that most of the volatile organics came from the students themselves and were surprised to find very high emissions of methylsiloxanes, which are used in antiperspirants and other personal care products,’ Nazaroff says. ‘We are using that same instrument now in regularly occupied household environments with the same goal of, not just measuring the composition of the air and how that composition varies with time, but trying to tease out from the evidence where the chemicals are coming from,’ says Nazaroff. A third option is now starting to become available for these monitoring campaigns: air-quality monitors designed for consumer use. Unlike passive samplers, these provide instant results, but are an order of magnitude cheaper than the highly sensitive instruments. There are however a lot of concerns about their accuracy. Singer’s team has been assessing both low-cost particle sensors and carbon dioxide sensors. ‘A consumer can now go out and for $200 buy a particle monitor. Some of them give reasonable estimates of particle concentrations under many conditions. Others are so inaccurate that they mislead rather than inform,’ says Singer. The team have recently redone an assessment of consumer carbon dioxide monitors. ‘The newer devices are much better than they were eight years ago: a number of these new devices are operating within specifications,’ he says. The data on inside air – however it is collected – is often complemented by laboratory-based investigations and modelling studies. ‘There’s a big role for modelling. 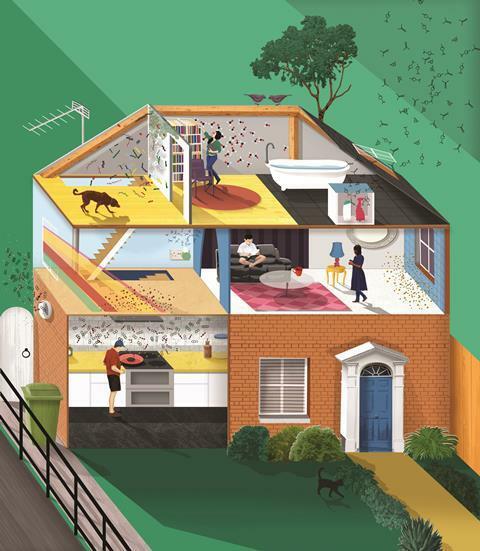 This includes population exposure assessments, to complement the large-scale surveys, and detailed modelling assessments of processes on indoor air composition and on exposure and health consequences,’ says Nazaroff. Another key part of the puzzle that chemists are working on is how the chemical composition inside our buildings evolves over time. Outdoors, most of the chemistry is driven by ultraviolet light. ‘The lighting levels in indoor environments are considerably lower than they are outdoors, so the importance of photolysis is diminished,’ Nazaroff says. ‘Indoors, photolysis occurs at much longer wavelengths because the UV from outdoors has been cut out by glass in windows and indoor lighting does not have a UV component,’ explains Nicola Carslaw, an indoor air chemist at the University of York, UK. Indoors, surface and interface chemistry is much more important. ‘The indoor environment has a lot more surface material per volume of air than an urban air basin and that translates to a much larger importance indoors of surface-associated processes,’ Nazaroff says. There are hundreds of different surfaces in our buildings from relatively smooth marble and stainless steel to fleecy surfaces with massive surface areas. These all sorb, and then interact with, air pollutants in different ways. Reductions, oxidations and acid–base chemistry have all been observed taking place on indoor surfaces. The resulting molecules can then be released back into the air either immediately or at a later point in time. Techniques including surface spectroscopy, atomic force microscopy combined with infrared spectroscopy and quartz crystal microbalance measurements are being used to study how nicotine and other volatile and semi-volatile organic compounds interact with silicon dioxide glass surfaces, gypsum in plaster and titanium dioxide in paints. ‘We’re trying to get quantitative information related to how these gases interact with these surfaces,’ says Grassian. 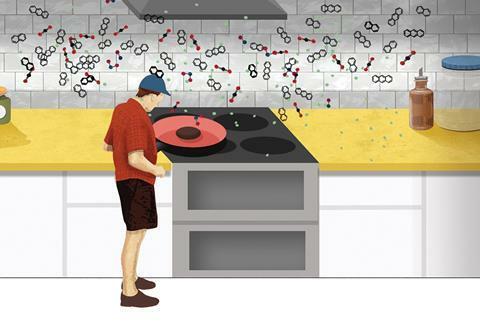 Reactions with these surfaces lead to a host of new chemicals with potential health impacts. Perhaps the most interesting surface of all is the human body. ‘Skin contains many oils and fatty acids and we know that these species can react with ozone in the air to produce a range of secondary pollutants. As human beings walk around a room, they are removing the ozone and producing other chemicals,’ explains Carslaw. Another complicating factor here is that the surfaces change over time. ‘The current thinking is that when you have a new surface in a room it’s probably quite distinct in its properties, but over time it’s likely that it will become more similar to the other surfaces in the room because humans will deposit skin cells and carry out activities such as cooking that cause a film to form on it,’ explains Carslaw. Her group is currently investigating the chemistry of indoor surfaces using detailed chemical models. As well as allowing chemicals to react on its surface, there is growing realisation that human skin is a route for air pollutants to enter the body. It has previously been assumed that air pollutants predominantly enter our bodies through the lungs. Ventilation rates in homes should also been considered, says Carslaw. In the US, mechanical ventilation ensures a constant exchange of indoor and outdoor air. But in the UK, and other parts of northern Europe, mechanical ventilation is less prevalent, and as homes are becoming more energy efficient the rates of natural ventilation are decreasing. ‘This means that homeowners are increasingly being trapped indoors with chemicals that can’t escape,’ she explains. The harmful effects of tobacco smoke have been extensively studied, with the health effects of gases such as hydrogen cyanide and formaldehyde sufficiently nailed down to drive significant indoor air quality legislation around smoking indoors. But the recent growth in e-cigarettes is bringing the issue back to prominence. In 2016, the Lawrence Berkeley National Laboratory team announced that the thermal decomposition of two solvents (propylene glycol and glycerine) found in most e-cigarette liquids, leads to emissions of 31 toxic chemicals such as acrolein and formaldehyde in significant levels. The team is currently working to assess what fraction of each of the chemicals emitted goes into the indoor environment compared to straight into the user’s lungs and evaluating the health impact of ‘second-hand vaping’ compared to that from second-hand tobacco smoke.